Mini Classic Glee Gum is a tasty treat. 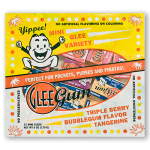 Each li’l pack contains 2 pieces of delicious, natural Glee Gum. Spearmint, Cinnamon, or a medley of assorted flavors. 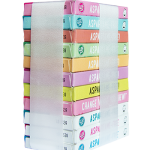 stuffers, baby and bridal showers, weddings, and more! 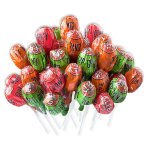 TANGERINE GLEE GUM INGREDIENTS: CANE SUGAR, GLUCOSE, GUM BASE (CHICLE, CALCIUM CARBONATE, CANDELILLA WAX, DEHYDRATED CITRUS PEELS), BROWN RICE SYRUP, NATURAL TANGERINE FLAVOR, CITRIC ACID, GUM ARABIC, RESINOUS GLAZE, BETA CAROTENE FOR COLOR, BEESWAX, AND CARNAUBA WAX. 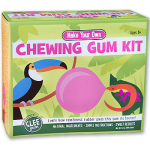 CINNAMON GLEE GUM INGREDIENTS: CANE SUGAR, GLUCOSE, GUM BASE (CHICLE, CALCIUM CARBONATE, CANDELILLA WAX, DEHYDRATED CITRUS PEELS), BROWN RICE SYRUP, NATURAL CINNAMON FLAVOR, GUM ARABIC, RED BEET FOR COLOR, RESINOUS GLAZE, BEESWAX, AND CARNAUBA WAX. 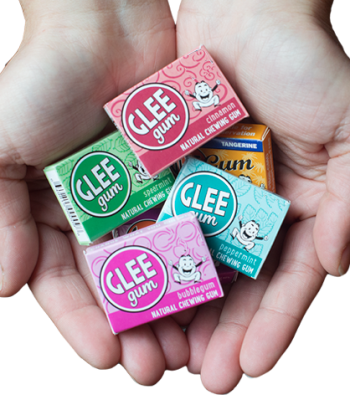 BUBBLEGUM FLAVOR GLEE GUM INGREDIENTS: CANE SUGAR, GLUCOSE, GUM BASE (CHICLE, CALCIUM CARBONATE, CANDELILLA WAX, DEHYDRATED CITRUS PEELS), BROWN RICE SYRUP, NATURAL FLAVORS, GUM ARABIC, RESINOUS GLAZE, BEESWAX, CARNAUBA WAX, AND RED BEET FOR COLOR. 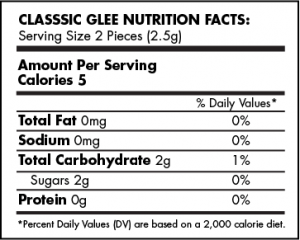 SPEARMINT GLEE GUM INGREDIENTS: CANE SUGAR, GLUCOSE, GUM BASE (CHICLE, CALCIUM CARBONATE, CANDELILLA WAX, DEHYDRATED CITRUS PEELS), BROWN RICE SYRUP, NATURAL SPEARMINT FLAVOR, GUM ARABIC, RESINOUS GLAZE, BEESWAX, CARNAUBA WAX, AND CHLOROPHYLL FOR COLOR. MIXED (TRIPLE) BERRY GLEE GUM INGREDIENTS: CANE SUGAR, GLUCOSE, GUM BASE (CHICLE, CALCIUM CARBONATE, CANDELILLA WAX, DEHYDRATED CITRUS PEELS), BROWN RICE SYRUP, GUM ARABIC, NATURAL FLAVORS (STRAWBERRY, RASPBERRY AND BLUEBERRY), BLACK CARROT AND BLACK CURRANT JUICE FOR COLOR, RESINOUS GLAZE, BEESWAX, AND CARNAUBA WAX.